We have worked on everything… from transport trucks and trailers, RVs, motorcycles, SUVs, cars, vans & pickups, even a few boats along the way. We’ve done work for movie studios. Classic cars, New York taxis and hundreds of police cars. 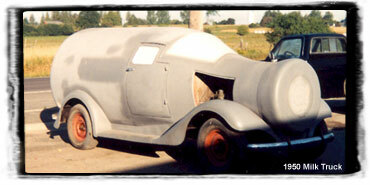 We really can do almost anything – but I doubt you need a 1950 Milk truck? Had a collision or just have some rust to touch up? Have a classic you’d like to restore or does it just need a new colour? Want to cruise the streets in your slammed import or just have a new hood painted? Whatever your need, rust repair, collision repair, restoration or custom performance modifications, M&R Autobody can have you back on the road quickly, and without killing your budget. For a free, no-obligation quote, contact us now. No appointments necessary.